Includes buffet breakfast, tea and coffee. amazing hospitality teachers and students. We are looking for lucky door prizes. If you have anything to contribute please email alliance@pbc-shs.eq.edu.au. We continually receive great feedback for our breakfasts. These events are a key forum providing a great opportunity to connect with other like minded business people from within our community as well as Palm Beach Currumbin State High student leaders and key staff members. The popularity of our breakfasts highlight the wonderful community support for our school and we are very grateful. Connections are regularly made that result in beneficial relationships, it's win-win! 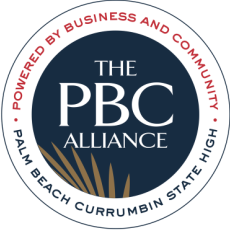 In 2019 we will continue to see PBC's Hospitality students handle the event including preparations and service. Our hospitality staff and students work together within their curriculum to coordinate the set up of the venue, preparation and cooking of the food plus front of house service on the day. This experience builds their confidence and employ-ability. Come and be a part of this wonderful group of community minded people. You don't have to be a member or partner to come along. All are welcome. We are always looking for lucky door prizes. If you have anything to contribute please email alliance@pbc-shs.eq.edu.au.